The industry has its issues, but more people drive big trucks today than ever before. Much has been written in recent years about the challenges faced by truck drivers in the United States today. Driving an over-the-road truck can be lonely and isolating. Wages for many truckers have stagnated. There’s a growing number of government rules regulating what drivers can and can’t do on the job. Truck driving is tough work. It also remains a very important job. 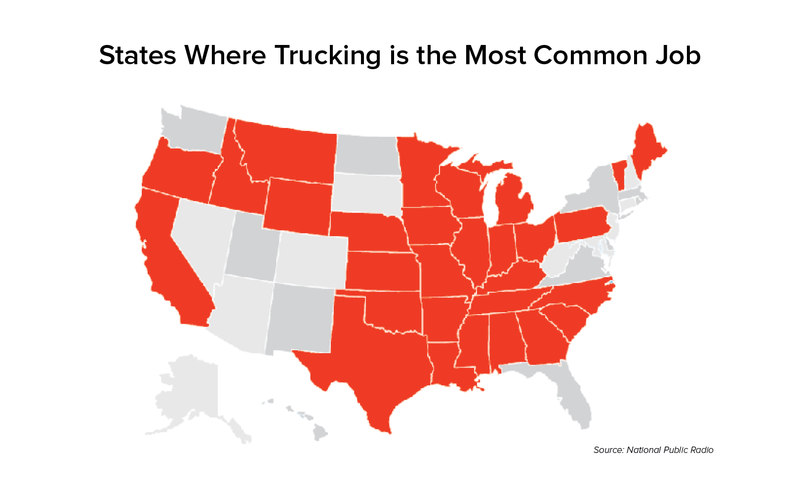 An overwhelming amount of statistics show that trucking may be the leading indicator of the country’s economic health. If trucks are moving more freight, that means Americans are more productive and earning more money. Below are seven reasons—backed by recent stats—explaining why trucking is America’s number one job today. Despite a much-publicized shortage of qualified drivers, truck driving remains one of the fastest-growing occupations in the United States. There are more than 1.7 million heavy-duty and tractor-trailer truck driving jobs today, according to the U.S. Bureau of Labor Statistics. Overall, a total of 7.4 million Americans have jobs tied to the trucking industry. A recent study by National Public Radio found that “trucker driver” was the most dominant job in 29 U.S. states, including California and Texas. Rail and intermodal transportation have been growing in recent years. However, commercial trucks still move the lion’s share of goods and materials. These statistics from the American Trucking Associations’ 2017 Trends report illustrate the industry’s dominance. Over time, trucking’s percentage of the overall freight market is projected to decline slightly. However, industry groups project steady overall growth for the industry. Below are projections for the next 11 years from the American Trucking Associations (ATA). At a time when many American blue-collar jobs in have been in decline, the number of truck driving jobs has grown. That is because trucking has been immune to two of the biggest forces affecting the U.S. workforce today—automation and offshoring. Driving a truck over the Interstate cannot be outsourced to India or China. Likewise, robots have not learned how to drive and park a rig. That latter fact may not always remain true, as truck manufacturers are attempting to develop trucks with self-driving technologies. Many economists look to trucking as a key bell weather of the United States’ overall economic health. When more trucks are moving and freight rates are rising, that means consumers are spending more, and retailers and manufacturers are adding to their inventories. It’s no coincidence that, at a time when consumer confidence and overall employment are at the highest levels in nearly 17 years, the trucking industry is also seeing growth in shipping demand. Is the American dream dead? Not with trucking, apparently. Owning and operating a single truck or a small fleet remains the most frequent route to business ownership. In fact, trucking is an industry made up of small businesses, with 91% of motor carriers operating six or fewer trucks. Over 97% of trucking companies today have fewer than 20 power units. According to the Federal Motor Carrier Safety Administration (FMCSA) there were 493,730 trucking companies operating in the United States in 2016. That number is down slightly from a few years ago, but the fact remains: many of America's small business owners are truckers. When compared with U.S. household median income, driving a truck remains a good way to make a living. According to the National Transportation Institute (NTI), for-hire drivers earn an average annual income of $54,000, while private fleet drivers make well over $70,000, on average. Median income for all U.S. households was $56,516 in 2016, according to U.S. Census numbers. Trucking remains a solid, middle-class living, but there is concern about the industry’s wage growth and ability to recruit younger workers. According to the NTI, driver compensation has risen only 6.3% over the past five years. By comparison, the minimum wage has increased 45.2% over the same period of time.